This book is the WINNER OF THE CARNEGIE MEDAL. It says it right there on the front cover. So I won't feel too badly for being honest in my review of it. It's already won an award. It is already being talked about as a good--if not great--read of the year. 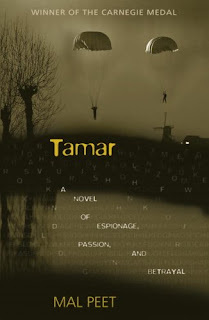 It's not that I hated Tamar, which is "a novel of espionage, passion, and betrayal." It's that I felt uncomfortable with it. Two young men are working undercover in Nazi-occupied territory. Tamar is the story of what happens when they both fall in love with the same woman. Also what happens when insanity takes control of a person. Not just one of the main characters, but in some of the minor ones as well. I suppose it falls under the heading of 'war changes a man and makes him do things he never thought he was capable of.' Tamar is the code name for one of the men. So decades later, when the son of one of these two men is expecting a baby, the father makes a request...to name the baby (if it's a girl) Tamar. This causes a very strange reaction from the soon-to-be-grandmother. Though it's not quite apparent to the readers why. The big secret is revealed slowly and suspensefully within both timeframes. The undercover spies provide the narrative in 1944-1945. And the grandaughter Tamar provides the narrative in 1995 and 2005. Mal Peet's Carnegie Medal-winning masterpiece is a story of violence and resistance, love and deception, loyalty and betrayal. If violence, deception, and betrayal sounds like a good way to spend the afternoon....then Tamar may be the book for you. Reading about murder--even if it is belatedly related to a crime of passion--has never really been my cup of tea. So to watch this plot unfold chapter by chapter was just painfully uncomfortable for me. It wasn't that it was poorly written. It was that I didn't want to go where it was taking me. It was well written. The characters were well developed. I just had a hard time liking most of them.